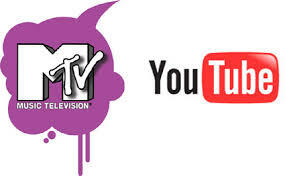 While Miley Cyrus was busy destroying any chance of a Hannah Montana syndication contract anytime soon during her 4 minute performance on the VMAs last night (I’m not even going to provide a link to her performance), approximately 288 hours of video was uploaded to YouTube, or roughly 72 hours of video uploaded per minute. The VMAs, or the Video Music Awards hosted by MTV, have been a staple for since the first award was given in 1964. It was the only award show to honor the intersection of popular music, cinematography and commercialism. When musicians signed with a major record company, they were able to tap into what used to be commercial gold – the music video. The music video took off as a critical part of a musician’s career and “package” in the 1970s through the 1990s. As the technology for music kept making tunes more portable, the technology for film kept making your music videos look better. And as MTV gained ground as a major “taste-maker” in the music business, affecting everything from radio play to ticket sales, the music video became not just something you did on the side, but became a cornerstone for new album promotion. With the entrance of 24-hour news networks and the availability of cable TV, people across the country were watching more television. And the fact that MTV was broadcasting music videos essentially 24/7 meant that audiences could discover your band at 2am while eating pizza, or during the coveted “TRL” show that ranked the top 10 music videos. This wave of home entertainment meant only one thing to the commercially-driven mind: more time to promote the product. Record companies were among these commercially-driven groups. They poured hundreds of thousands of dollars into making 3-minute music videos for groups in order to sell more and more records. The longer your music video was in the Top Ten on “TRL”, the more CD sales you saw. And if you won a VMA for your video – it was almost as good as winning a Grammy. In fact, it was pretty easy to draw a line from “Best Music Video” at the VMAs to “Best Record” or “Best Album” at the Grammy’s. In 2003 when Apple introduced iTunes, a revolutionary idea was born. People could buy a song, one at a time. All of the sudden, marketing one song didn’t mean marketing a whole album. An album no longer became a complete work, but rather a set of individual works released at the same time. Once this happened, music videos were the next wave to get hit. In economics they teach you that decisions are made “at the margin”. Meaning when you don’t necessarily decide to buy lawn mower until you need it – supply only matters at the point it hits demand and demand only matters if there is some kind of supply. When iTunes was released, the “margin” at which people had to choose music became their personal computer, not a shelf of music at Best Buy. The internet now allowed for you to (legally – also a new idea in the age of Napster) purchase music without leaving your house. To adapt to this new landscape, record companies began putting their music videos online as well as on the air (MTV, VH1, BET, CMT, etc). Ads were taken out online, entertainment websites began offering a “Video” section and you still had to put a video on television – record companies were fighting on two fronts. And then the hammer dropped. YouTube was founded in 2005 and bought by Google in 2006, and it left the music industry in the dust. Free uploading capabilities meant that the average “Joe” could record a video on his new “tapeless” video recorder and upload it to the internet for the entire world to see. It didn’t take long until musicians, the “undiscovered” ones in particular, to jump on this opportunity. Cover songs, live recordings, original works and even footage from professional performances, found their way to the internet via YouTube (and Vimeo – another, more recent artist-favorite). For the first time ever, your cousin’s garage band could take a video camera, shoot their own video, edit it, upload it and SHARE IT – all without one single record executive telling them to spike their hair or cut their jeans. Fast forward to 2013 and the entire landscape has changed. MTV officially cut it’s full name from Music Television to simply MTV, stopped playing music videos all together (except for a couple “high number” cable channels) and shifted their annual Video Music Awards ceremony to become more of a “hype” event, focused on live performances, clothing and next-day headlines. On top of this, YouTube is now essentially the only place you’ll find music videos. Instead of spending hundreds of thousands on elaborate sets, condensed radio-length songs (3min), and special directors – major music groups are focusing on the quality of their video as either a plot-based story, showcase of live performance, or simply beautiful cinematography. For example, one of the most recent viral hits was Macklemore’s “Thrift Shop” video which cost the artist a mere $15,000 to make and resulted in top album sales, a unprecedented rise to fame and, perhaps most importantly of all, increased attention to the artist’s other music videos and songs (the “related videos” tab on YouTube is perhaps their most important feature after the video itself). The music industry has gone through more change in the past 15 years than it has over any other span of time. The advancement of technology, the ability to have entertainment on demand and in your hand, plus the prized hipster mentality of discovering music before your friend does, has driven this industry into a crazy and wonderful world where the customer has the first say and not the record company. The music video is by no means dead. In fact, it’s the opposite. The ability to shoot high quality videos at a reasonably low price (a high quality camera starts at about $1,000), and more importantly the ability to share what you find on the internet via social media, has given music videos more clout than ever before. And because they’re not bound by time restrictions, or content for that matter, record companies and un-signed artists alike are finding new, dedicated audiences through their music videos. It brings MTV’s annual awards show into question. Can a company whose focus is no longer music really still be a leader in the industry? Maybe it can, but more importantly, maybe it shouldn’t. To be honest, the title “MTV VMAs” is an oxymoron. Watch one hour of the VMAs and you begin to question everything about humanity. The entire event is staged as a “hype-machine”. The focus isn’t the artist or the video, or the award. The focus is MTV. The residual coverage of the VMAs rarely makes it past 30 days in the music headlines, and I would venture to guess that record sales do not spike for too long after the VMAs are over. I didn’t watch last night’s VMAs, and I’m not sad I didn’t. If I want to watch any portion of last night’s award show, I’ll watch it online…on YouTube. Next Next post: All You Have To Do Is VOTE!